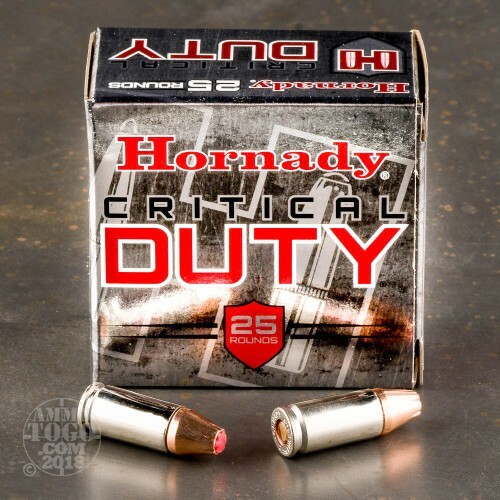 This 9mm +P cartridge is from Hornady’s Critical Duty line of ammunition. 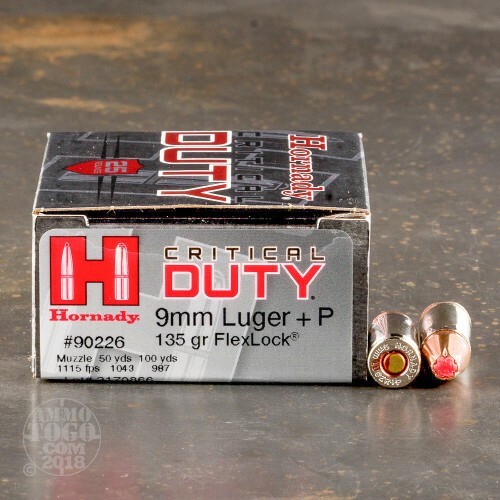 The round’s 135 grain FlexLock bullet provides a panoply of features which make it the one to count on when you’re forced to draw your weapon. In its hollow point sits a Flex Tip, a column of polymer which prevents fabric clogging and further promotes wide and debilitating expansion. The FlexLock’s InterLock band greatly prevents core and jacket separation, even after it has passed through a variety of common urban barriers. 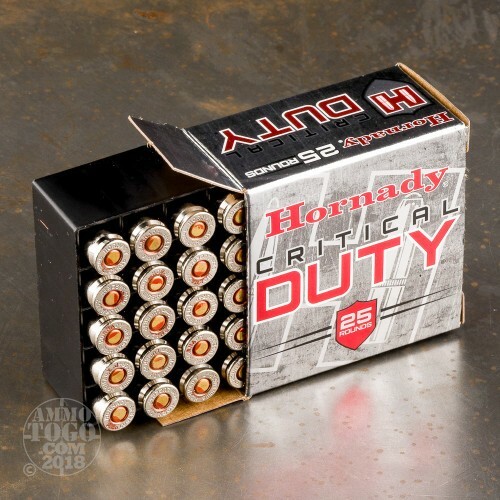 This bullet’s core is made of high antimony lead and is exceedingly tough, which along with its jacket makes it especially potent for neutralizing human-sized threats, and its cannelure prevents setback during feeding. A Critical Duty round sports a reloadable brass casing that is plated in nickel. That plating not only resists corrosion and enables smoother cycling, but is also more easily seen during a chamber check in a darkened environment. Please note that this is +P ammunition, and is not meant to be implemented in a firearm that isn’t rated to take it. 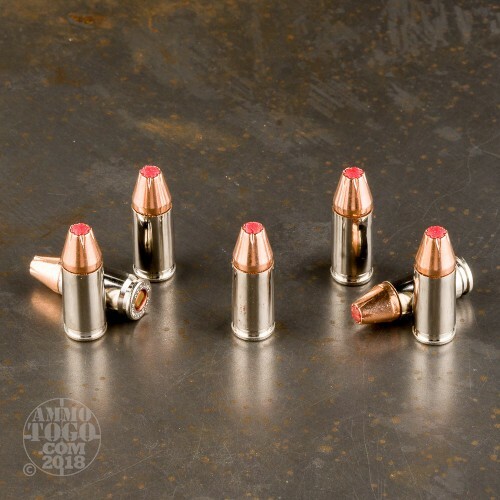 Expansion Diameter Compared to All 9mm Luger (9x19) Ammo Tested MIN 0.32" MEDIAN 0.50" THIS AMMO 0.41" U.S. dime MAX 0.90"
Penetration Depth Compared to 9mm Luger (9x19) Tested 0" 10" 20" 30" MIN 5.6" MEDIAN 17.7" THIS AMMO 21.8" MAX 47.5"